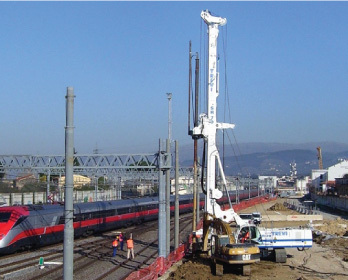 Large Diameter Piles (LDP) performed with telescopic kelly bar and drilling tool (auger, bucket, core barrell) is the most commonly used technology throughout the world, as it allows to drill piles in any type of soil or rock. Bored pile is a cast-in-place concrete pile where the bored piles have to be cast on job site. The operating sequence includes the following steps: boring – generally using steel casing or stabilizing mud such as bentonite suspension – drilling and for uncased piles mud de-sanding. After these, reinforcement bar will be put into the bore hole and concrete will be poured into the bore hole. CFA (Continuous Flight Auger) technology joins the advantages of fixed piles with the versatility of application of drilled piles. Continuous Flight Auger piles are performed with a partial soil removal, thus with a lateral soil compression that increases the final load bearing capacity. The construction procedure consists of boring the soil by means of a continuous flight auger assembled on a central hollow pipe. On completion of boring operation, auger is extracted while concrete is poured throughout the internal hollow pipe. When required, piles may be reinforced for their entire length with reinforcement cages inserted in the still wet concrete. In the operating phases piles are dug with simultaneous driving of the casing and the augers into the soil. When casing is completely driven the pile’s digging may continue only with the blades. Once the digging phase is finished, the blades and lining are extracted; at the same time the concrete is poured through the internal passage in the core of the blades. Once pouring is done, the cage is inserted into the still wet concrete. The continuous diaphragm is constructed with secant primary and secondary piles, properly overlapped; with this application it is necessary to construct guiding walls to ensure correct planimetric positioning of the piles and to guide the lining pipe on the surface. The great performance of the rig is guaranteed thanks to the double independent rotary head that, assisted by crowd-force of the crowd-winch system, assures the best production rate. With respect to driven piles, when drilling a pile, driller has a/ways had to solve the problem of the bore walls collapsing. Use of casing, bentonite and polymers is the classical solutions. With the CFA method, in which soil extraction and concreting are simultaneously performed, the bore remains always full, either with spoils or concrete. Therefore the problem of watt collapse does not exist. 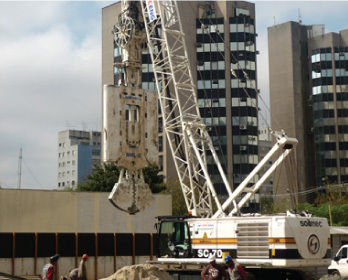 With the displacement pile technology, in which the tool drills the soil and displaces it laterally toward the bore walls, situation becomes very close to driven piles: no more spoils, clean job site! 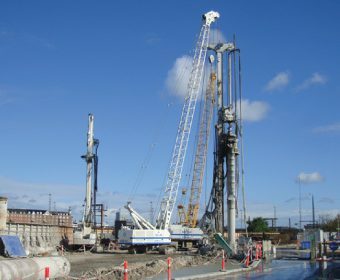 Even if this type of piles is since years quiet popular especially in the north of Europe, more recently, the increasing costs to dispose of excavation spoils have promoted displacement pile method development. Also the environmental problems in the contaminated soils that are led to the development of soil compaction tools which eliminate or minimise the quantity of spoils brought to the surface during pile execution have given their contribution to spread the method. Also, being noise and vibration free, compaction (displacement) is an interesting alternative to driven piles, especially in urban areas. 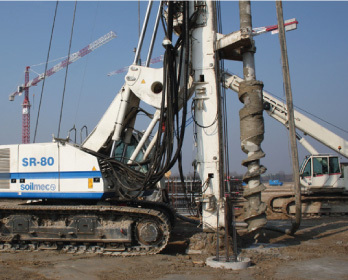 SOILMEC, on the basis of its extensive experience gained in CFA(Continuous Right Auger) and CSP/CAP (Cased Secant pile/Cased Augered Pile) technologies, has developed a range of new tools which have been purposely designed to reduce torque and crowd force required – enlarging the range of rigs to be used, to give higher production rates and keep transport and dumping costs low. 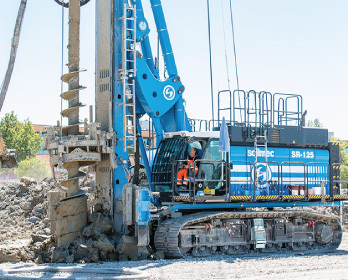 Thus alternative to DP (Displacement Piles) technology, SOILMEC discovered and patented the new compaction technology called TCT(Traction Compacting Tool). TURBOJET® is an important development of the “Soil Mixing Technology” allowing the construction of such consolidated structures in a fast and cost effective way, with high quality standards. The application of the system ranges from very soft low consistency cohesive soil (up to 15% of organic soil), to non-cohesive soil from loose to medium consistency (sand and gravel). The TURBOJET® technology relies on a specially designed tool combining the effects of high kinetic energy “jet” with mechanical mixing performed by suitably positioned blades. This way, high quality and fast mechanical breakdown, alongside effective soil-mixing with high speed jetting are guaranteed. This technology allows columns to have the same mechanical strength and diameter as the ones obtained using other soil mixing systems, but in a faster and cheaper way, making it highly competitive. Thanks to a wide range of tools of different geometry, the technique can be adapted to different soil characteristics, thus optimizing the working parameters. As the system is very flexible, it is also possible to continuously modify the soil-mixing energy and the quantity of stabilizing agent (binder), depending on the desired design parameters. The geometry of the columns constructed with Turbojet are not affected by the soil characteristics, as in many jetgrouting systems, but remains unaltered throughout the whole depth. High performance tools ensure fast soil consolidation, whereas the control system constantly records the operating parameters and automatically modifies them based on the feedback from the ongoing work. The DW (Diaphragm Walls) are walls built in the underground starting from the surface. The excavating system consists of a clamshell bucket (grab) with the same thickness of the wall to be built. The excavation is carried out with primary and secondary panels, with bentonite or polymeric slurry. The panels are reinforced with prefabricated steel cages. Before the cage lowering, the slurry into the trench has to be treated and cleaned. The wall can be used as excavation support, foundation element or as containment structure for the flow of underground water. Diaphragm walls tend to be used for retaining very deep excavations as they can be designed to take very high structural loads. The water tight walls formed can be used as permanent structural walls. Reduced number of joints in the wall which ultimately improves the walls water tightness. Work may be carried out right against existing structures and the line of wall may be adjusted to any shape in plan. Diaphragm wall construction is relatively quiet, and minimum noise and vibration levels make it suitable for construction in urban areas. 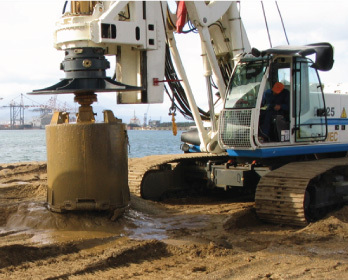 capability to obtain columns of consolidated soil with diameter ranging from 60 to more than 300 cm by using small diameter drilled holes, in general not larger than 180÷200 mm. capability to overpass pre-existing foundations, boulders, rocky layers. 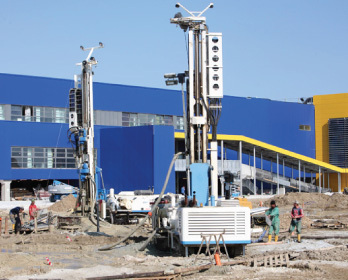 use of light weight and small-sized drill rigs in small working areas. Geothermal energy is the heat naturally contained within the Earth. It is the cause of many geological phenomena on a planetary scale. “Geothermal energy” is usually used to indicate the part of the Earth’s heat that can be recovered and exploited. This heat originated from the Earth’s formation over 4 billion years ago, when dust and gas consolidated. This natural stock of hot water is called a geothermal reservoir. The Earth’s geothermal power is an immense and inexhaustible source of cost-effective and sustainable energy, but just a fraction of it has been used so far. In the past, exploitation of this energy was limited to those areas where geological conditions permitted a carrier (water or vapour) to “transfer” the heat from hot deep rocks to the surface or near to the surface forming the so-called geothermal resources.